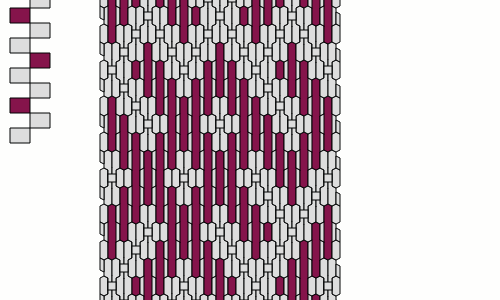 You can find nice examples of bedouin patterns on http://www.einesaite.com/al-sadu/ and https://backstrapweaving.wordpress.com/tutorials/tutorial-warping-the-bedouin-alouerjan-pattern/. I’d like to share with you a question about the interface of the editor. In plain mode, interface is easy. You click on an hexagon to change its color. For pickup it’s a bit more complicated. In fact when you do a pickup, a thread that should be underneath goes above the band. 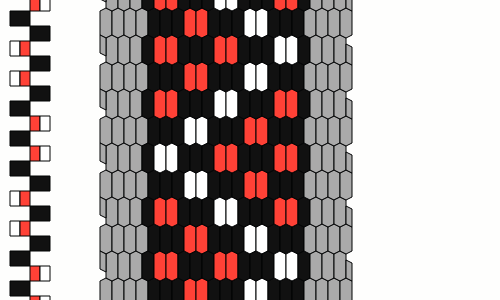 The new release of the loom pattern editor now allow you to create a pickup loom pattern. 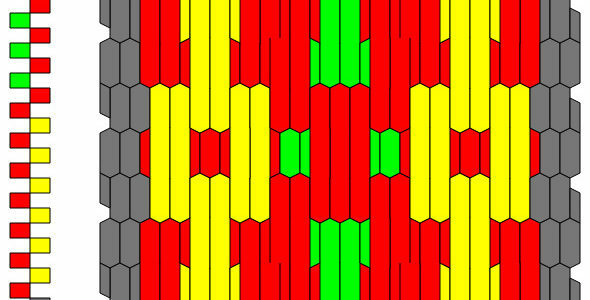 Click http://raktres.net/l/Kj to go to this pattern or go to http://raktres.net/seizenn/loom_weaving_editor.html to start a new project. Some other features come with this version. You can discover them on the left panel and I will describe them on next post.